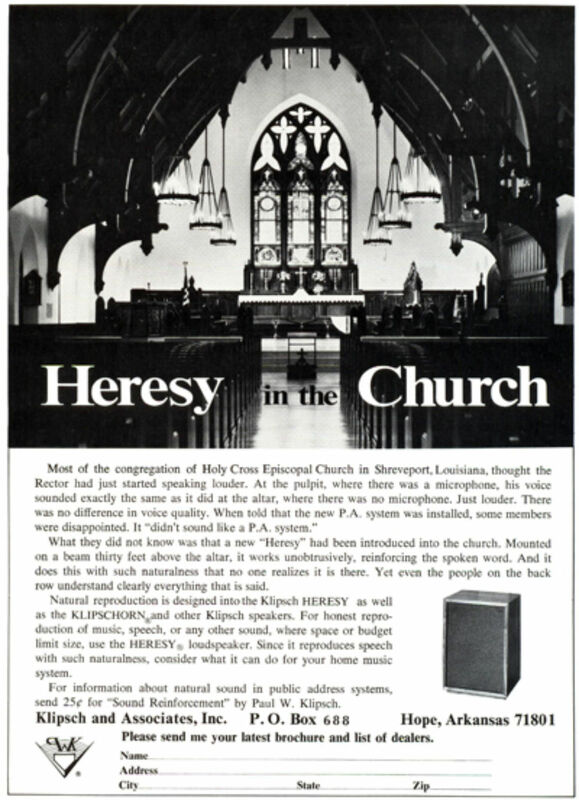 From the earliest records we have, Paul Klipsch was solidly involved in Christianity. Paul’s father, Oscar Colman Klipsch, had a good bass voice, and used it frequently in church choirs. When his tuberculosis forced the family to move from Indiana to the Southwest, times became tough. Paul was not able to attend school regularly, and classified himself as a “miss-fit.” His mother, Minna Pearl Eddy Klipsch, was struggling to get her teaching degree. During these years she used the Bible to teach reading fundamentals to young Paul. Much has been written about Paul’s “pew vaulting,” and his taking notes during the sermon so as to properly grill the minister afterwards. For some lesser-known aspects, Paul speaks for himself. Just why the Almighty singles out some individual of questionable moral quality to carry some particular burden is not for us to know. Seems, though, history is full of such examples. If my course in the past was by divine inspiration, my prayer is that I can carry out the resulting obligation. If this entails waging war on the quacks and sharpies of the fringe of the art, I pray for strength and guidance, for I’d rather work than fight. Definitely a man of convictions! As mentioned earlier, Paul’s first formal affiliation was with the Methodists. By the 1950’s he had joined the Presbyterians, allegedly because they had the best pipe organs. Eventually he was honored by the offer of a Deacon’s position. As part of his preparation, he was given the appropriate church materials to study. When he got to the predestination section, it was a deal-breaker. Paul firmly believed that a person was capable of guiding their own destiny, and went shopping for another church. He then landed in the Episcopal camp. He married Valerie Booles at St. Mark’s in Hope, AR in 1976, and also donated the organ some years later. They say that the Salvation Army will pick up a man out of the gutter and turn him over to the Methodist church. They will dry him out and get him a job and then he meets some nice folks at the Presbyterian church and they invite him to come over and visit. And he does, and he joins. And the same thing happens at the Episcopal church, and when they get through with him, he’s ready for the gutter again. I do not wish to discriminate between Methodist or Muslim, Baptist or Buddhist, Catholic or Jew. As a Freemason I was taught that freedom of religion was part of the creed. This scholarship fund has grown exponentially (imagine that! ), and is carried on today by Paul’s widow, Valerie Klipsch. 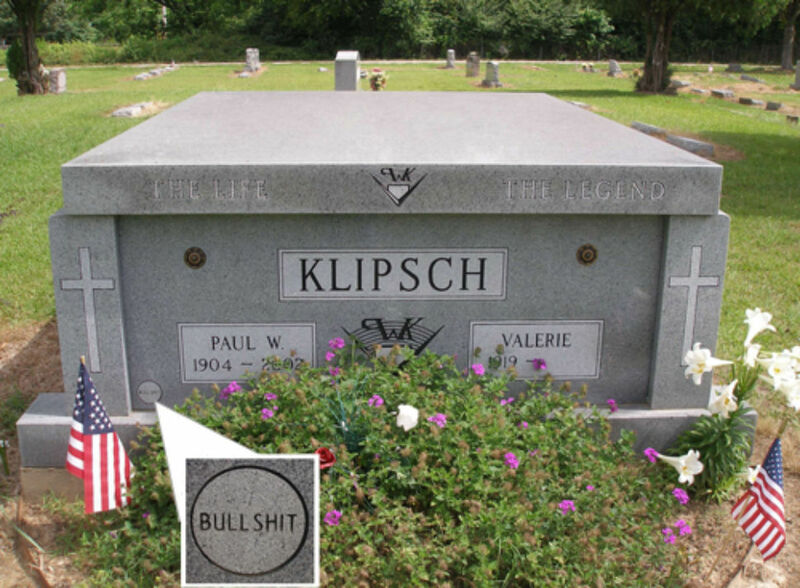 Finally, even the traditional Klipsch PWK logo contains Biblical meaning. The seven arcs connecting the “V” represent sound waves emanating from a corner. The number seven* was chosen because it has repeated significance in the Bible…in particular from Genesis 41, the seven good years and seven lean years. This prophesy allowed Pharaoh to weather the coming famine. Many feel that science and religion are mutually exclusive. PWK definitely did not. *While there is no proof, it is interesting to speculate how these numbers applied to PWK. Paul had seven “good” years in Houston working in the oil prospecting industry (1934-1941). The PWK logo was first used in our literature in 1955, which happens to be seven years after he established a manufacturing facility (1948). Those were pretty “lean” years. However, there was also a seven year stretch between these two that could be considered “lean”.